You are probably familiar with the image of him waving his long ponytail and releasing his vengeful bass guitar tunes on unsuspecting audiences throughout the world. 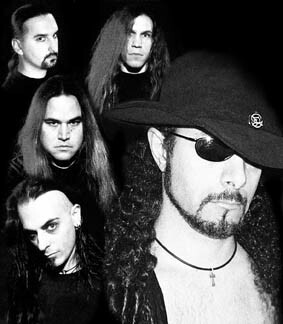 When he is not touring with Speed/Thrash Metal legends Overkill, though, Carlo (also known as DD) Verni spends his limited free time working on the Goth Metal project The Bronx Casket Co, who have only just released their 3rd studio effort "Hellectric". We all have a dark side that we need to explore! Much as I would love to talk to you about Overkill, the reason for this interview is to present the latest effort of your other project, The Bronx Casket Co, so I will try to focus my questions on them. Let's start by talking about the fact that some people have the belief that The Bronx Casket Co are nothing more than a side-project. Now, there is indeed a very thin line that separates full-time bands and side projects - what is the case with The Bronx Casket Co, and how committed are its members to its music? Carlo: I think everyone is having fun doing this and we will continue to do it as long as it stays fun. So far it has been great and all of us in the band get along well, so we should be going for a while...I mean it is our 3rd record together. Which are the ideas and feelings that this band "allows" you to explore that is impossible to do with Overkill? Do you see any similarities between the two bands? Carlo: Well a lot of things Overkill would never really play with are orchestrations and keyboards, or female vocals so there are a lot of cool thing to try out that are completely different from Overkill. As far as similarities, besides that I am in both bands, I don't really see any. You have just recently released your latest studio album with the quite appropriate title "Hellectric". What is the general idea behind this specific album, and how do you feel about it now that it has finally been released? Carlo: There is no real specific idea behind it. I wanted more orchestral stuff on it so maybe that could be something I tried for. It was a lot of fun to work on and I am happy the response so far has been so good, so we'll see how it continues to go. "Hellectric" has quite a few similarities with both your previous efforts, and it has both a melodic and aggressive side to it. What are the main differences, though, that the average The Bronx Casket Co fan should expect to detect, and how do they represent the evolution of the band's sound and style during these last eight years? Carlo: I think you have it right, Bronx Casket is a mix of aggressive stuff and strong melodies. I also think the music has a certain groove to it that I always try to have. This one I feel just did what the last 2 did but better. The production is stronger.... I think the melodies and riffing are stronger too...so it's probably a mix of the last 2 and then trying to do that at a higher level. Music should always be open for interpretation, and what I got while listening to "Hellectric" was that it is an effort from a group of professional musicians with a very "advanced" sense of humour. Did I manage to hit the nail on the head there? What is the attitude that the fans of this band should have towards your music? Carlo: Well I definitely have a dark sense of humour so I suppose that comes out and lyrically, as bleak a picture as they paint sometimes, I think there is always a way to see a light at the end of the tunnel, so that is where the dark humour really comes in. There is a four-year gap between the release of "Sweet Home Transylvania" and that of "Hellectric". How much did the fact that the majority of the members of this band are involved in other very important bands contribute to such a delay? Carlo: Not really much. I have just been really busy with Overkill and touring so I have not really had a lot of time to put into them. Plus it's so much work. I do all the music and lyrics and melodies and played a bunch of guitar and sang a few songs, so while I love it and it is a lot of fun to do...it is also a lot of work. When did you begin working for the ideas behind the album, and how long did it take for you guys to materialise them? Carlo: I basically never stop writing so it's more a question of when did I decide to put it all together. I actually finished this record last Jan, but we waited till now to put it out because the timing was better with my schedule. There are many talented and well-established composers working for this band. Are you all equally involved in the creative process of an album? What is the process that you follow in order to bring a song to life? Carlo: There are great players on this album, but I do the writing. Usually I demo up the whole record with keys and vocals guitars ...everything. Then send a tape to the guys to learn, then we get in the studio and go for it, if some new ideas come up we do it then, but generally I have everything worked out before we go in. If you were asked to describe the members of the band in a few words, which would they be? Which are their strengths and weaknesses? Carlo: Don�t know what their weaknesses are but everyone is strong and taking what is on tape and adding their own attitude to it to come up with something cool. Do you have to be in a specific mood in order to prepare ideas for a Bronx Casket Co song? Carlo: No not really, but it's difficult sometimes to not jump into too heavy a riff like an Overkill song. Your label's press release describes "Hellectric" as the album that all radio stations will be eager to get their hands on. Which are the songs that you guys are planning on using for that purpose? Are either "Little Dead Girl" or "Dream of Angels" suitable for such a task? There is one song whose quality and uniqueness makes it easily stand out from the rest of the compositions, and that, in my humble opinion, is "Let My People Go". Can you tell me a few things about this song and explain how it gels with the remaining eleven compositions? Carlo: Well I'm glad you like that one, although I don't think it stands out from the others really. I had that and liked it because it had kind of an Egyptian feeling to the music. Apart from the obvious duties, you have also handled the production and engineering work for "Hellectric". This must be quite an enjoyable experience for you, so much so that you did not allow other people to handle this work for you! On the other hand, you acquired the assistance of Mike Romeo (Symphony X) on the mixing and orchestral arrangements - why is that? Carlo: I have know Mike for a lot of years but we had never worked together. He lives about 10 minutes from my studio in New Jersey so we just got to talking about doing a few songs and then a few more and then we were working so well together I said lets just mix it too. All in all it he was great to work with and he really is talented with that orchestral stuff. I must admit that I was quite sceptical when I saw that you did a cover of Lynyrd Skynyrd's classic "Free Bird", but the result was really good. Why did you choose that song? Aren't you afraid that most of the "traditional" Lynyrd Skynyrd fans will not be so understanding of your effort? Carlo: I imagine traditional Skynyrd fans will hate it, but thats ok. I had an idea to do it and an arrangement etc that I really liked so we went for it. I originally had planned on Myke singing it, but he could not bring himself to do a Skynyrd song for whatever reason ...so I sang it. Tell me a few things about your collaboration with the Trans Siberian Orchestra and the playwright Andrea Lepcio. When did you come up with this idea, and what are your current plans as far as this project is concerned? Carlo: The TSO people were only musicians that are in the band that also did a few showcases when we were doing that for backers. Andrea I have known for a long time and she loved the records and thought she could weave a story with the music, so that is what we did. And then I wrote a bunch of other songs for the show as well, it's kind of a Phantom meets West Side Story show. As far as I know, you have never gone on tour in support of any of your albums - is that true? What are your plans as far as "Hellectric" is concerned? Carlo: I would love to do some shows, but it has to be the right thing. I keep getting asked to be on thrash type of things, and that really won't work for Bronx Casket. What would be the ideal visual concept for a Bronx Casket Co? Should I expect to experience a theatrical concert similar to those of Kiss and Alice Cooper? Carlo: More like Motorhead in Hell. Which are the expectations that you have from The Bronx Casket Co, and how do you perceive your future with them? Carlo: Well, hopefully we will sell a few units, and then be part of a tour where we can bring the music directly to the kids. I would like to still be doing these records 10 years from now, I really enjoy doing them. Carlos, thank you for the interview - a message to your fans. Carlo: Carlo...but you�re close again. See you on the road!